Cleveland Cavaliers small forward LeBron James made another milestone as he became the youngest NBA Player in History to reach the 28,000 career points. James is now the eight players in NBA to reach the milestone, joining seven other past and present NBA Superstar with the likes of Shaquille O’neal, Dirk Nowitzki, Wilt Chamberlain, Michael Jordan, Kobe Bryant, Karl Malone, Kareem Abdul-Jabbar. LeBron James entered the game 12 points shy of reaching the milestone in their game against the New York Knicks at Madison Square Garden. In the second quarter James finally reached the milestone, ending the first half of the game with 19 points and 6 assist to lead all scorers for both teams. The Cavaliers won the game after blowing a 27 point lead and manage to escape the rally of the Knicks after cutting down the Cavs lead into 5 with only less than a minute in the game. 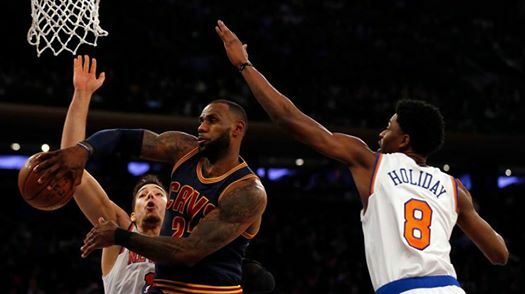 The Cavaliers hang on to win the game in thrilling end game 111 – 104, the Cavs has already beaten the Knicks 3-0 this season. Meanwhile the Cavs improves their NBA Standing and maintain their solo lead in the Eastern Conference with 34 wins and 15 loss while the Knicks falls to 22 wins and 30 losses. LeBron James finished the game with another monster game at Madison Square Garden with 32 points, 10 assists and 5 rebounds in 12 of 20 shooting from the field. James is also improving his career points to 28,020 career points which currently at No.8 ranking in NBA All-Time Career points. No Comment to " LeBron James Reach the 28,000 Career Points, Youngest in NBA History "